Every November, this historic coastal village celebrates the coming of the “Silver Darlings” – a.k.a. herring. Clovelly’s festivities in honour of this tasty, nutritious fish are supportive of sustainable, seasonal fishing, and recall a local tradition stretching back over 400 years. According to records, in 1749 there were about a hundred herring boats in the port. Visitors can expect fascinating talks and exhibitions, live music, delicious food and drink, and activities – including workshops that turn collected sea debris that would otherwise harm wildlife into beautiful bowls. Clovelly Herring Festival takes place on 18 November. For more information, visit their website. It’s a hook to the left! And then a jab to the right! Let’s do the time-warp back to 1976. It’s a world without men and women – only lovers, fighters, dancers and all-nighters – one where the mean streets of Philadelphia are filled with campy song. 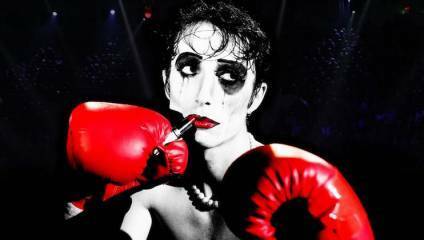 With stunning successes like Goldilock, Stock & Three Smoking Bears under their belts, The Wardrobe Theatre brings you another of its signature adult-only, darkly comic shows – a loving, playful fusion of boxing classic, Rocky, and the cross-dressing cult musical, The Rocky Horror Show. Catch Rocky Shock Horror at venues across England until the end of January 2019. For more information and to book tickets, see here. The award-winning French-Irish performer is touring her latest show, Where Are We Now?, which contemplates our crazily-changing world. Framing this question through the arresting, final songs of Bowie and Leonard Cohen, alongside the likes of PJ Harvey and Nick Cave, Camille explores the beauty of the age as well as its turbulence with her fierce, mesmerising voice. We caught up with Camille ahead of the tour – read our interview here. Where Are We Now? tours England and Ireland from 13 – 29 November; for more information and to book tickets visit Camille’s website. Oxford’s Ashmolean is hosting a weekend of faith, folklore, song and dance in celebration of the city’s different communities. From Bollywood dance and Scottish herbal magic, to Nepalese drumming and Persian music, the festival promises to be engaging for visitors of all ages – and the whole thing is free! No longer just the stuff of New York-set Christmas movies, skating is a staple of the British festive period nowadays. But did you know it has been a popular pastime – and means of navigating frozen waterways – here for over 400 years? Opening on Thursday at the National Heritage Centre for Horseracing and Sporting Art, Skating brings together 30 works, ranging from 17th century Flemish painting and Victorian panoramic scenes to 20th century photographs (including those taken by the iconic Bassano studio), vintage skates and Pathé films.